In the first quarter of 2018, there has been an increase in the number of invitations that were issued in the Express Entry system. The statistics are not as impressive as they were in 2017. Hence, IRCC is continuing to think about the means to make this management tool better. The best feature of this quarterly review is to know the effect of the modifications which were made in the past. Seeing it along with the present changes, the immigration authorities can arrange the exact size of the draw. In the past, there were irregular numbers of ITAs. Whereas, in the present year the draws show that many ITAs were issued. There were two draws which issued 2,750 and four of them sent an invitation to 3,000 applicants. There was coordination between managing immigration numbers and the CRS score. In the fresh format, the authorities can arrange for the exact number of candidates for inviting. In case, the number of candidates, having the lowest score, is more than the number of invitations, authorities use a tie-breaking system. It issues invitations which rely on the timing of arrival and affixing of a stamp. 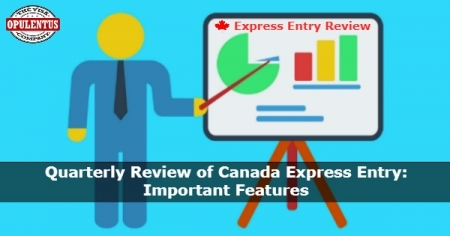 When the scores are similar the date and time of submitting the Express Entry profile get the preference. In 2018, six draws were held in the first quarter. Seven draws were held 2016 as well as in 2017. IRCC had made a fine start in 2017 and 24,652 ITAs were issued in the first three months. The figure for 2018 is 17,500. There are many factors responsible less number of ITAs. Firstly, the numbers of immigrants, who are arriving in the present year, belong to the second half of 2017. Moreover, IRCC alone knows the number of applications which belong to 2017. Additionally, we must notice that the processing time of invitation in all cases is six months. Secondly, 2017 was the year where the immigration authorities relied heavily on the Express Entry supervision system as a target in skilled worker immigration. In the past, they were processing applications from an earlier system. The officials had issued adequate ITAs in the early period of the year. They had to meet the yearly targets. Thirdly, presently officials have sufficient data regarding the number of invitations to issue. They also know the number of newcomers who are submitting the complete application. The factor of drop-off is important while fixing the ITA to be issued. In comparison to the previous year and fewer ITAs in the first quarter of 2018, the CRS score is low. During the present year, the CRS score was as low as 442 and as high as 456. The range is tight for the candidates to receive an ITA. In the previous year, this range was as low as 434 and as high as 468 in the quarter of Jan-March. In 2017 and 2018 CRS scores were lower in the first quarter in comparison to 2016. In 2015 the scores were fluctuating in the first few months. IRCC is now providing regular snapshots of the composition of the Express Entry pool. It shows details of the number of candidates in the pool and their CRS scores. In The recent draw, the CRS cut-off was 446. The snapshot has shown that there were 6,200 candidates having a score between 431 and 440. It was a little lower than the necessary score. These snapshots show that many candidates are close to the points necessary to receive the ITA. They can increase their points by improving the test result in a language. Furthermore, they can evaluate their educational degrees or gain work experience for one more year. There are other ways also like getting an approved job offer, or completing some period of studies in Canada. Besides they can depend on the qualifications of their spouse to make a huge difference in receiving an ITA. During the present year, the CRS score was as low as 442 and as high as 456. The range is tight for the candidates to receive an ITA. In the previous year, this range was as low as 434 and as high as 468 in the quarter of Jan-March. During 2017 and 2018 CRS scores were lower in the first quarter in comparison to 2016. In 2015 the scores were fluctuating in the first few months. The immigration authorities of Canada have a plan to increase immigration level in the next three years. The country has an aim to welcome one million newcomers in the immediate future. The best way to reaching this level is to increase the numbers of candidates to get an invitation. The Express Entry has entered in its fourth year now. IRCC officials are in possession of data about the exact requirements to issue ITAs. It must ensure that the immigration target is achieved.